Click the blue Add User button to add your team members. 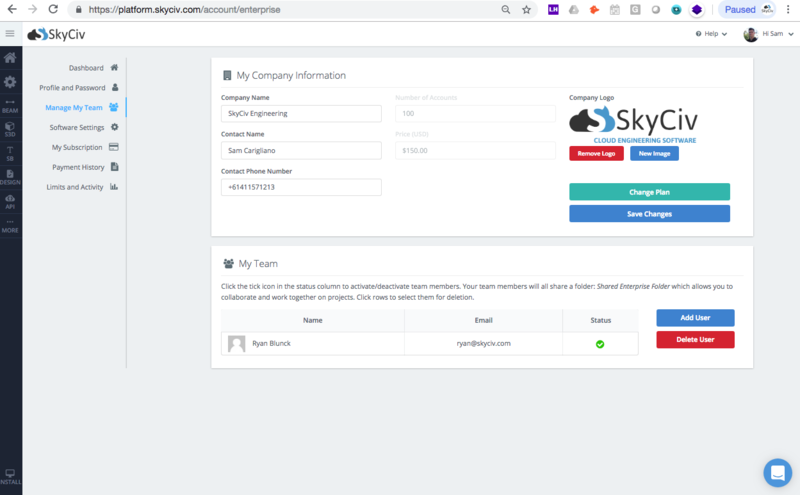 A small modal will display for you to enter the team members information, including first name, last name and their email (which will be used as their username). An email will also go out to your team member, notifying them that they now have access. You can also control access (deactivate and delete) to your team from here. If you need more seats, simply click the green Change Plan button and an email will go out to your Account Manager. From here, you can also upload and control your company logo. This logo will display on all PDF reports generated by SkyCiv software. Upload your logo so you can market your company to prospects, clients and other engineers in a clean and professional manner. By default, your Enterprise Account will come with a Shared Enterprise Folder which is a shared folder for all your team members. You can create sub folders within this this folder to house all your projects, so that your whole team can collaborate in real-time. Any files outside of this folder will be private and can only be viewed by the individual account holder only. Alternatively, you can use our file sharing capabilities to share individual folders and models to work together. All revision controls are automatically applied to any shared file. As admin, you can also download receipts from your account settings. Simply visit Payment History and you can review all the payments made under your subscription. You can also download your PDF tax invoices from this area.